Click the button below to be sent to the City's Facebook Page! By "liking" the page, you will be even more informed about ongoing events with the City! ​For those of you interested, the informational meeting will be held on Monday, August 15th, at 4:15p.m. in the Boyd Nursing Home Dining Room. We had a great turn out! We'll see you next year! It has been a long time in the works but the City of Carrollton and Carrollton Police Department now have a hummer of our own. Obtained for free from the City of Waverly and their police department, it was given a make over with a new paintjob as well as the removal and addition of new decals. 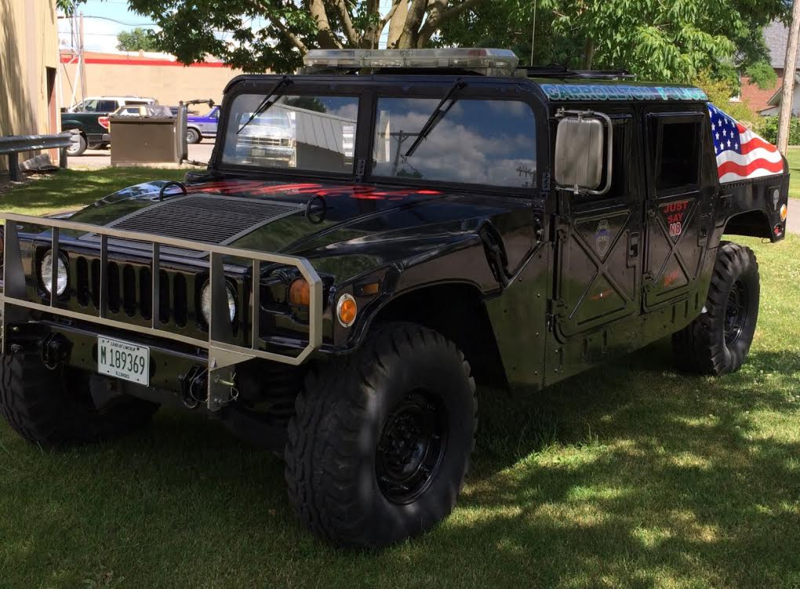 The hummer's primary use will be for public relations and community outreach through the Carrollton Police Department and it's DARE program. It will also be used to assist when needed on any MRT callouts by the Greene County MRT team to execute any high risk situations such as warrants. It is scheduled to make it's public debut with Darrel the DARE Lion in this years White Hall Parade. Greene County Graphics and Designs for their donation of all decals and labor of placing them on the hummer. Main Street Tire for providing a new battery for the hummer at cost. Lacrosse Lumber Co. in Carrollton for donating various supplies. With October being Breast Cancer Awareness month, all of us at City Hall, CPD, Probation, Judaical and the State's Attorney's office have joined the fight against Breast Cancer. Every Friday in October, these shirts will be worn to support the fight for a cure. Each year the organization Mothers Against Drunk Driving (MADD) recognizes individuals and organizations in law enforcement who have done outstanding work in the enforcement of Driving While Intoxicated and Driving Under the Influence in their area, and a part-time police officer has earned this distinction. Part-time police officer Austin Morrow, who is a full-time officer for the White Hall Police Department, was recognized by MADD for not only demonstrating high arrest numbers, but also acting as a leader and motivator to help make an impact on reducing alcohol- related deaths and injuries. Morrow has been a part-time police officer for the City of Carrollton for the past four years. 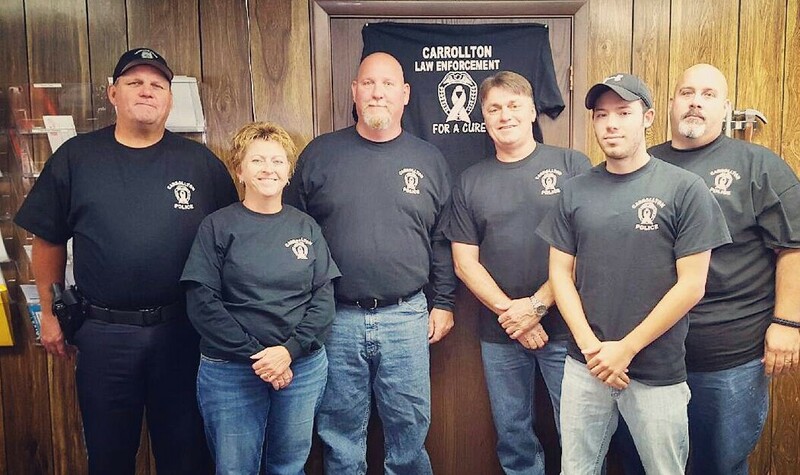 "When I received the paperwork asking for submissions for this recognition, I thought it was only for full-time officers," Carrollton Police Chief Mike McCartney said. "He worked a few hours for us here and there but not a whole lot, but when he did work he was always aggressive in this area." McCartney called MADD and inquired if he would quality for submission for recognition. "I tole them he only works part-time, but when he does work he does progressive patrols and he'd issued quite a few DUIs when he is working and made a lt of alcohol-related arrest," Chief McCartney said. "He actually led our department in DUI arrests only working part-time. He also instructs some alcohol classes in other departments, so he is very much against drunk driving." Chief McCartney said that while Morrow didn't win the actual award he did receive an commendation for doing an outstanding job, was recognized as a progressive and dedicated officer, and he earned a pin to wear on his uniform. McCartney said officers like Morrow are a credit to law enforcement. "out department, on average does not have a tremendous amount of DUI arrests, but I think in the last year, just mainly working a few weekends here and there, he has made three or four DUI arrests and probably had eight or nine alcohol-related arrests," Chief McCartney said. "That's pretty impressive for just a part-time officer." *Excerpt taken from the GPP article out of the September 30, 2015 edition. Carrollton Police Chief Mike McCartney, right, congratulates part-time Carrollton Police Officer Austin Morrow, left, for receiving recognition from Mothers Against Drunk Driving for his aggressive enforcement of drug and alcohol offenses while on duty. Morrow, though only part-time, led the Carrollton Police Department in DUI arrests this past year. 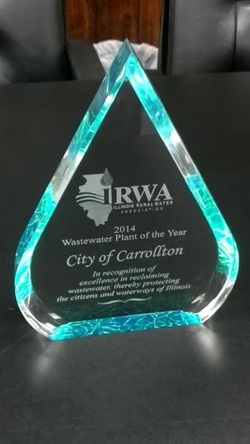 The City of Carrollton is pleased to announce that Jeff Reif, sewer plant supervisor, has been nominated for "Outstanding Operator of the Year" to be presented by the Illinois Association of Water Pollution Control Operators. 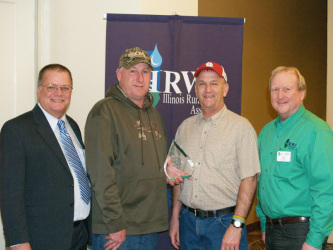 Jeff was nominated for the award by the Illinois Environmental Protection agency. The purpose of the award is to emphasize the relationship between adequate wastewater treatment and clean receiving water and to give public recognition and encouragement to those operators who have operated their facilities in an effective manner. Jeff is one of only six operators statewide being considered for this award. The winner will be announced at the Illinois Association of Water Pollution Control Operators annual conference in April 2016. We want to congratulate Jeff for his 24 years of dedication and commitment to the city of Carrollton. We wish him luck in obtaining this distinguished honor as "Outstanding Operator of the Year." August 19th was the first day of school for the Carrollton School District, and the kids weren't the only ones in attendance. Chief Mike McCartney joined students at St. Johns Catholic School, Officers Terry Gross and Aaron Mehrhoff joined students at Carrollton Grade School, and Assistant Chief Reg Pohlman stopped by the Carrollton High School. Officer Terry Gross said that this tradition was something that former Police Chief Mike Kiger had started years ago. 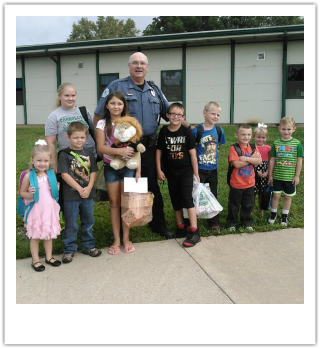 The kids at all schools met and talked with officers, and some got the chance to meet Daren, the D.A.R.E Lion. Pictured to the right is Carrollton Police Officer, Terry Gross with Daren the D.A.R.E. Lion at the Carrollton Grade School for the first day back school, on August 19th. Hero Night was a splash at the Carrollton Pool this past Sunday, August 2nd. Heroes from all around stopped in to pay a visit. Dozens of children were in attendance for the Super Hero Party at the Carrollton Pool. They were joined by several police officers and safety pup from Roodhouse Police Department. Don't forget about the Disney Princess Frozen Party to take place Sunday, August 9th, at 7:00 p.m. There will be prizes and giveaways! Admission is only $2.00. Hope to see you there! 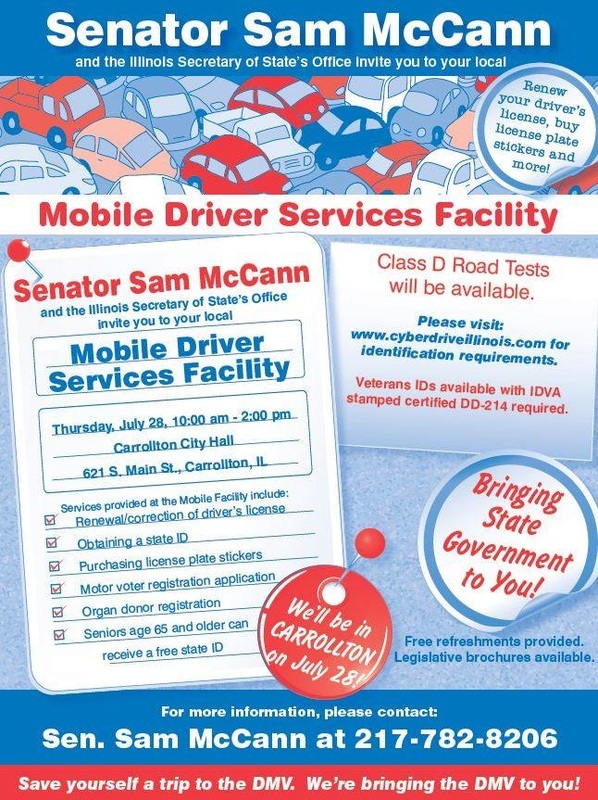 ﻿Senator McCann along with members of the DMV were at Carrollton City Hall on July 29th, to renew registration stickers for vehicles as well as issue state IDs. Many citizens took part in the event hosted at City Hall, and talked with Senator McCann about ongoing concerns in Illinois. "Waste Water Plant of the Year"
Jeff Reif and Dave Steinacher (Centered) accepting the award from IRWA on behalf of the Carrollton Plant. and is operated to the highest of industry standards".